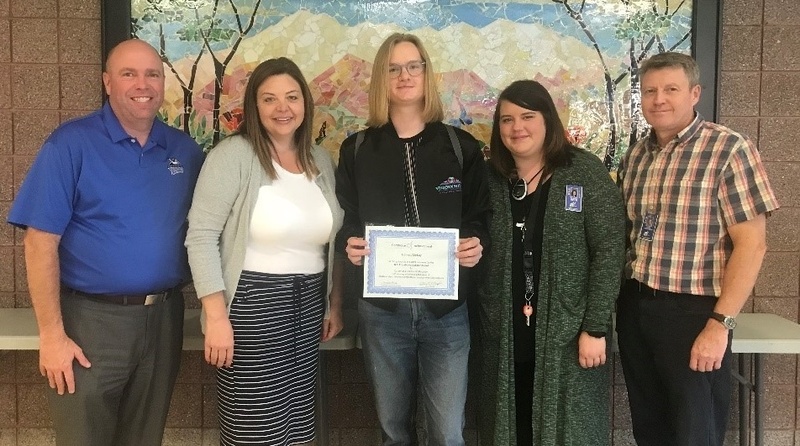 We want to congratulate Garrett Mckay, who was nominated by his teacher, Audra Yocom, for the Presidential Scholar in Career and Technical Education for PGHS. He was chosen based on academic rigor, technical competence, employability skills, ingenuity, and creativity. Garrett has maintained a high G.P.A. while taking multiple AP courses, earning industry certifications, and working at a local Tech company, “TAMS” for 3 years, where he gained valuable hands-on information technology experience. He will be graduating with more work experience in his field of study than many 4-year college students. His teacher Audra Yocom says this about him: “I have been fortunate enough to have Garrett in all the courses I have taught at PGHS. His passion for computer science is unquestionable—not to mention he is really, good at it. Garrett is one of those students you only worry about when you are trying to make sure they have enough to do and learn. He is helpful in the classroom and is so excited to learn everything I give him. I am excited to see where he takes his talents.” Students who choose to pursue a career pathway in high school, usually only earn one. Garrett has gone way beyond that, and he will graduate high school earning three Career Pathways in: Programming and Software Development, Digital Media, and Radio Broadcasting. He was worried about focusing on one field of study. However, in today’s world, having knowledge in all these areas will help make him a great leader at any company, since they all have to incorporate software development, as well as take into consideration the visuals and a good user experience. CTE Career Pathways are a great way for students to explore their interests in a field of study, receive hands-on experience, and gain knowledge that will ensure their employability after high school.